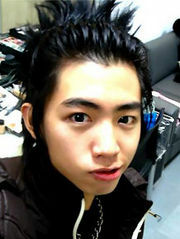 Hsie He-hsian (Chinese: 謝和弦; born April 15, 1987) is a Taiwanese singer and actor, best known as A Chord or R.Chord. 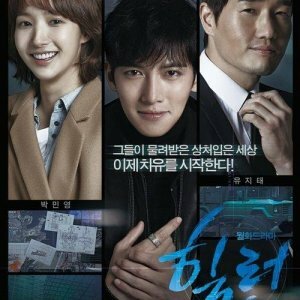 A Chord is known mainly for writing the lyrics of the popular song, Gou Ai, that was written for the purpose of the Taiwanese drama, The X-Family. Currently in show of K.O.3an Guo, Pets Ceng is singing a renewed version of Gou Ai. There are also parody versions of Gou Ai throughout the K.O.3an Guo episodes, mainly starting from episode nine. A Chord was named Xie He Xian (謝和弦) by his grandfather. The word he xian (和弦) means "chord" in English. A Chord started to play the guitar from a very young age due to the influences of his grandfather whom was looked up to as a role model. Unfortunately, A Chord wasn't very good in his studies, and started to compose songs, following the steps of his grandfather. By the year 2004, at age 16, A Chord has composed around 50-60 songs and clenched first place in a songwriting competition. Many people were amused by his humor when he attended Guess Guess Guess during the competition period and the audience was amazed by his songwriting abilities. The prize a contract with record label, HIM International Music but A Chord did not take up the offer of the contract and instead, went to play underground music with his band, SEA-LEVEL (海平面). A Chord made his first acting debut in KO One(终极一班) as Sha Yu/鲨鱼, following up with many other appearances in other Taiwanese dramas. He can be most remembered by most as his character, aChord in Taiwanese drama The X-Family (终极一家), in which he acted as a person with supernatural powers that was tasked with the responsibilities of protecting the Dimension. He then acted as the character Da Shu/大树, who was a little eccentric and claimed that he could see spirits, in Hanazakarino Kimitachihe(花样少年少女) in the year 2006. A Chord has composed many songs for Taiwanese dramas such as KO One's 終極一班, where he helped to write the lyrics such as, Gou Ai(够爱) from The X-Family (2007), and recently, 你曾經讓我心動 Ni Cen Jing Rang Wo Xin Dong from They Kiss Again(2007). He has also helped Danson Tang 唐禹哲 write the song 只欠一句我愛你 in Danson's 1st debut album, Ai Wo / 愛我. He has recently recorded more songs such as Dui Ni Ai Bu Wan(對你愛不完) and Guo Lai Ren (過來人).